Blended Learning happens when traditional education is blended with internet resources and digital media that transform and enhance the learning process. It allows our students to reach beyond the classroom walls and have control over their own path and pace of learning. Technology at The Epiphany School provides our students with the necessary tools to achieve the curricular goals of the School. We aim to prepare our students to grow and flourish as responsible digital citizens. Every classroom at The Epiphany School has a RealTouch Display. 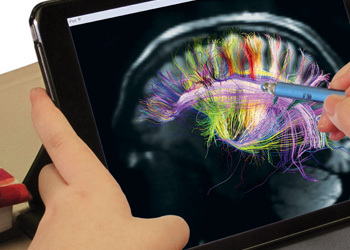 The Displays have unlimited software compatibility and high resolution images. They allow for unlimited use of all applications, and are easy to use – even for our youngest students. Teachers are able to incorporate media into their lessons and activities, and save their notes for future use. 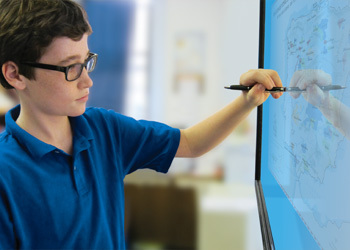 Each RealTouch Board is connected to an Apple TV which allows anyone in the classroom: students, teachers, and guests to display their work from any digital device to the full size screen. Both school buildings are set up for wireless network access in all classrooms. Protected wireless networks allow students to access network resources while using computers and iPads. Google Apps for Education is a suite of productivity tools for individual use and classroom collaboration. Our students can create, edit, and share files in real time for collaborative group work. All the work is stored in the cloud so our students can access their files anywhere using their school credentials. Teachers also use this suite to communicate assignments and announcements to students, and to provide students with necessary documents and materials. All students in the Upper School have an Epiphany School email address. This mailbox is managed by the School and allows students a fast and reliable method for communicating with their teachers and fellow students. These mailboxes can be accessed anywhere online, or through a student’s personal mobile device. Students in 2nd and 3rd grades have “Classroom Emails” used by the teacher to send and access work from the students’ iPads. The Upper School has two computer labs with a total of 60 MacBooks and 30 Chromebooks to provide students with access to the latest technologies. Students in the Lower School have access to 30 Chromebooks housed in custom docking carts. These laptops are used for learning support, delivering presentations and student classwork. Any class can request the use of these laptops at any time and they are available for students to borrow for use during the school day. In the fall of 2012, The Epiphany School launched its iPad Program. 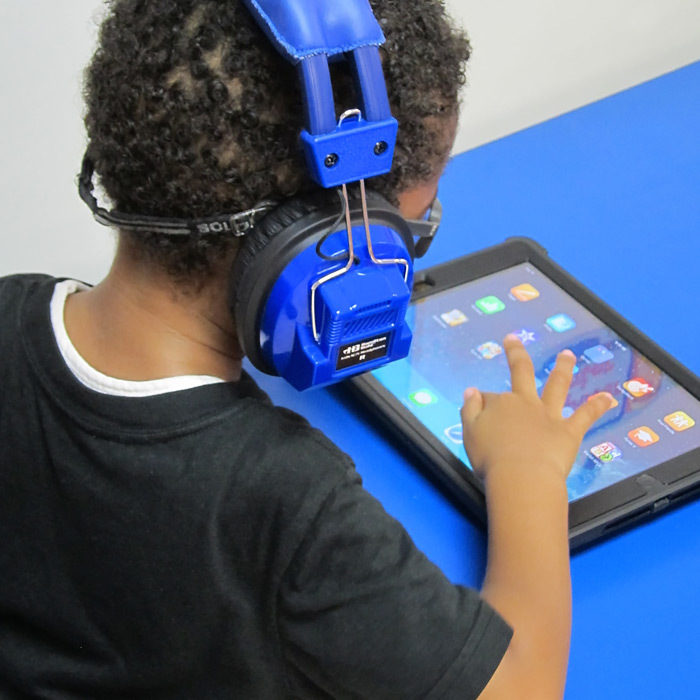 The success of the launch has led to a full 1:1 iPad program for all students in grades 2 – 8, a 1:2 iPad program in Kindergarten and 1st grade, and iPad Centers in Nursery and Pre-Kindergarten. The adoption of the iPad and its Apps has substantially enhanced our students’ academic experiences across all disciplines. The iPads have proven to be amplifiers of capability. With a variety of platforms to choose from, students are able to select what works best for them. Our students are encouraged to think critically about how to best solve a problem, communicate information, and collaborate with their fellow students. The iPads also allow for an individualized curriculum. Through online learning programs such as IXL and Reading A-Z, teachers are able to assign and monitor unique programs that best meet each student’s needs. Rather than eliminating other teaching tools such as textbooks, technology has expanded the menu teachers can choose from, enabling different forms of collaboration in the classroom and beyond, and motivating our students in new ways. For example, through the use of iPads, our students have engaged in new ways of learning such as: interactive Math textbooks in 6th – 8th grades, interactive Math Textbook and App in K – 5, Social Studies texts in 6th Grade, access to audio online content in Spanish, and collaborative projects that are presented to the class so our students are learning from each other as well their teachers.